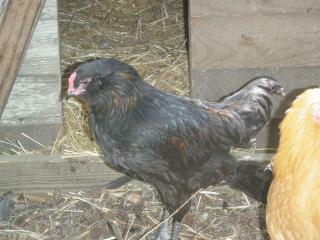 It appears that one of our "girls" could quite be a Mister Chicken! LOL! One of our Ameracaunas was growing a wee bit faster than the other one. A wee bit noiser than the other one, and getting a wee pit purtyier! Lately "she" has been trying our "her" crowing voice in the mornins! Looks like "Mr. Chicken" needs to be traded out. We'll be contacting Heritage farms to see what he has for trade. That was the deal with Heritage Farms. The owner wasn't quite sure if the chicken was a hen, so we made a deal that if "she" turned out to be a "he" we could simply bring him back and trade him in for another chicken, probably a younger one, but we don't mind. We were given two Buff Orpingtons from our friends in Mississippi! They are so beautiful and near point to layin'! The new girls have really helped out the other two with regard to calming down and setting a good night time routine of heading in to the coop to roost. With the addition of the two new hens we are, well, uh...the boys are talking about expanding the coop some to accomodate the chickens and their poop! 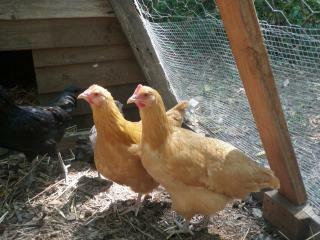 Besides, the girls need more room to peck and stretch their legs!